Enlisted February 27, 1864 at St. Clair for 3 years. Taken prisoner at Chickamauga, GA, September 20, 1864. Paroled. More Civil War Information that was taken from the "Record of Service of Michigan Volunteers in the Civil War 1861-1865" for soldiers serving from Michigan. 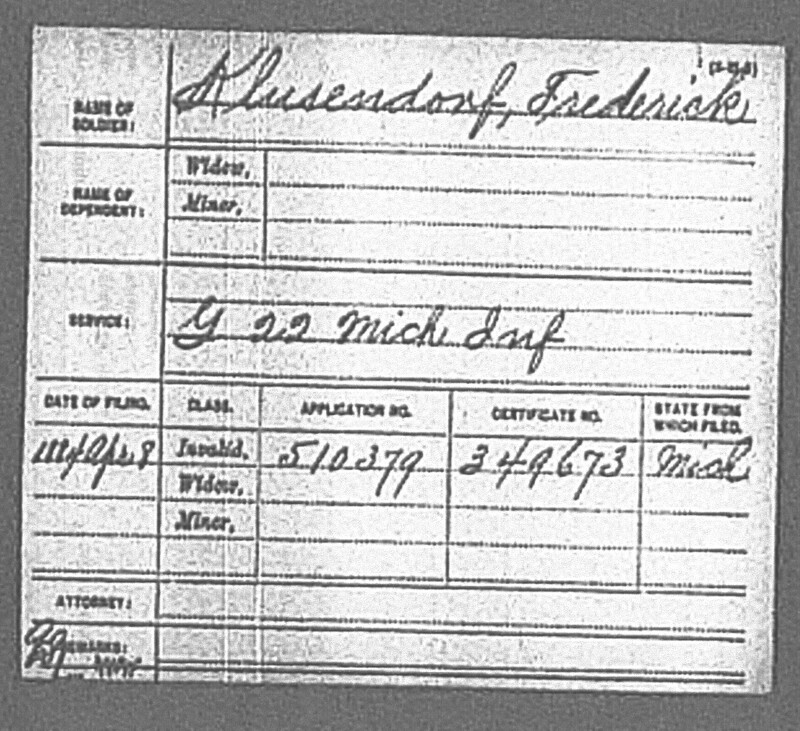 Kluesendorf, Frederick Cemetery: Meade - Macomb Twp. Born: September 29, 1840 (PRUS) Died: March 14, 1920 Casco. Enlisted in Company G, Twenty-second Michigan Infantry, August 22, 1862, at St. Clair, for 3 years, age 22. Mustered August 29, 1862. Taken prisoner at Chickamauga, Georgia, September 20, 1863. Paroled. Discharged at York, Pennsylvania, June 16, 1865. Present residence, New Haven, Michigan. Pension: Pension Request filed by veteran 4/8/1884, Application 510379. Veteran filed from Michigan. Researchers Note: Pension filed under the surname of Klusendorf. Researchers Note: According to a special veteran census conducted in 1890, this veteran suffered from rheumatism as a result of service in the Civil War.